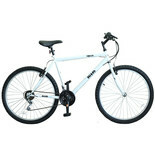 The Flite Rapide Bike features 26” Steel Unicrown Forks and a MTB 20” frame to provide a stable feel, whilst the deep sprung padded saddle offers a comfortable ride. The Barracuda Draco Mountain Bike has been constructed with a rigid MTB frame and 26" alloy forks for a secure feel, along with the padded MTB saddle. 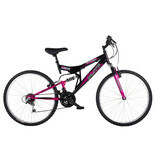 The Barracuda Draco Ladies Mountain Bike has been constructed with a rigid MTB frame and 26" alloy forks for a secure feel, along with the padded MTB saddle. 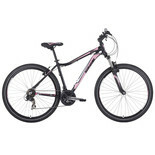 The Barracuda Draco Ladies Mountain Bike has been constructed with front suspension and a hard tail, complete with a padded MTB saddle. 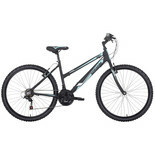 For adventurous off-roaders, or leisure cyclists, we stock a range of men’s and women’s mountain bikes. 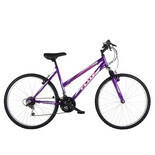 These bikes combine strength and style, and make easy work of rough terrain and the open countryside. 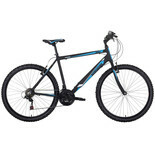 We supply mountain bikes with broad tyres and tough suspension to absorb shock and handle even the roughest terrains. 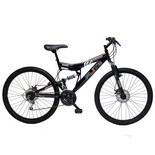 Mountain bikes are a great way to keep fit, and to travel where terrain may be rough, or hills steep. 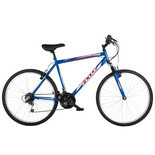 These bikes are a popular choice for commuters, leisure and sports riders alike. Our Raleigh-designed MTRAX bikes are suitable both in city environments and on rough terrain with cracks, bumps and crevices, thanks to its Shimano gears, suspension and disk-brakes. 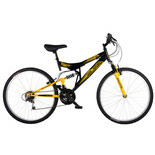 For vigorous outdoor riding we provide Barracuda bikes that can handle even the most difficult terrains. As well as quality mountain bikes, we provide road bikes, hybrids and folding models. You can buy online now, order by phone, or visit any of our superstores across the country.